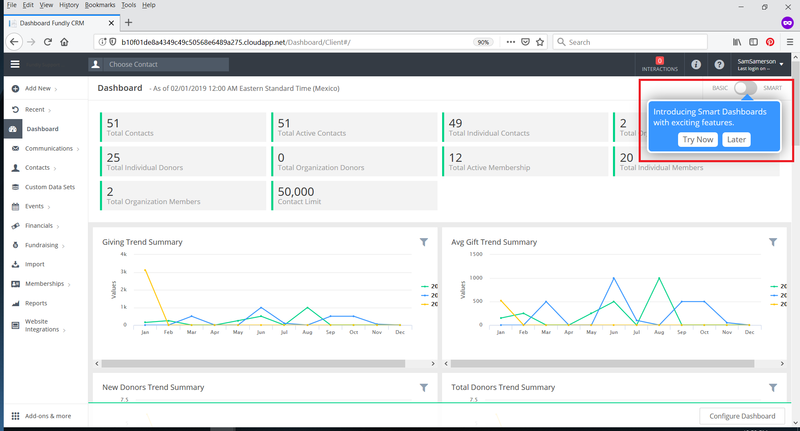 Today, we have released our new SMART DASHBOARDS for Fundly CRM v2!!! Read on to find out all the details! 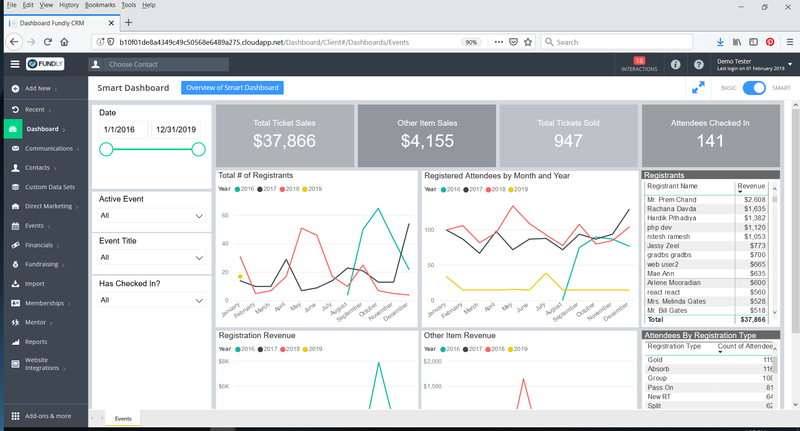 Smart Dashboards are advanced, interactive dashboards for Fundraising/Donations, Events, and Memberships. The Smart Dashboards are more advanced and flexible than the Basic Dashboard, have more data points/metrics than the Basic Dashboard, more filters than the Basic Dashboard, and allow exporting (to Excel) of both summary and drill down data. Each Smart Dashboard has a variety of filters that you can use to drill down into your data. In addition, you can change the sort order of the data and/or the field being sorted on and even export the data (to Excel or csv format). 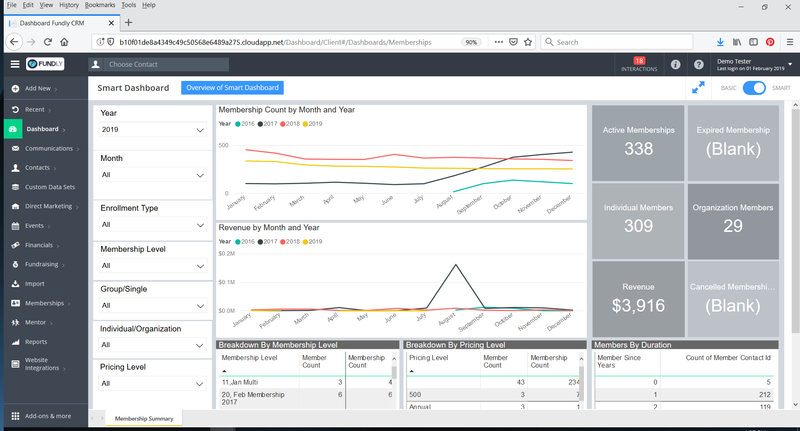 Smart Dashboards are a paid add-on; pricing varies by Fundly CRM subscription level (price ranges from $10 per user per month to $30 per user per month). All users can try Smart Dashboards for free for 15 days. To get started/to activate your free trial, choose Dashboard from the Main Menu and then click on "Try Now" in the upper right (go on, give it a try! There's no risk or obligation. At the end of the 15-day trial period, your free trial will expire. You will only be charged if your system administrator activates a paid account for you). 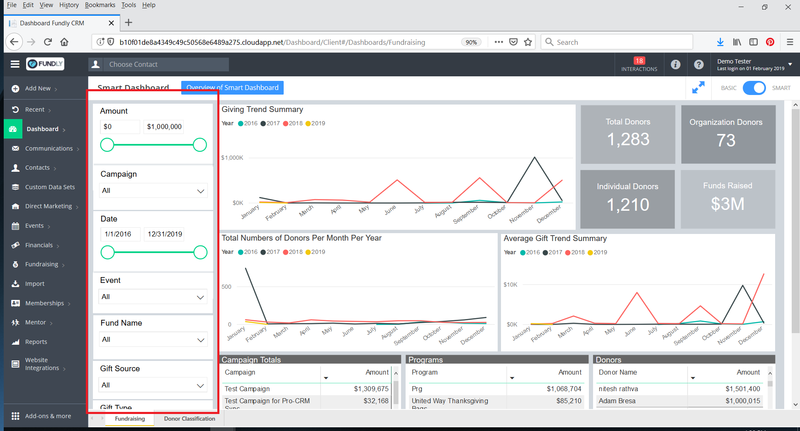 You can learn more about the full functionality of the Smart Dashboards by viewing the tutorials in the new "Dashboard' category of the support library. We've also added tutorials on the Basic Dashboard in the same section of the support library. We also expanded the "Donation Tips" reporting tutorial to include an explanation of the Donor Categories (which are used on the Basic Dashboard and the Donor Classification Smart Dashboard and also can be used as a filter in e-Appeals and be used in reporting). You can find the definitions on this tutorial, starting with step #11. We're holding a webinar on using the new Smart Dashboards on Tuesday February 12th at 11:30 am PST/2:30 pm EST. You can register at Fundlyevent.com.